Technical analysis is the most basic part of the investment process, but all too many Financial Advisors and Financial Planners aren’t aware that it is. 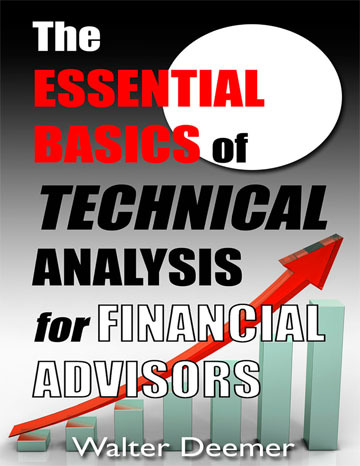 This book describes the essential basics of technical analysis of financial markets that Financial Advisors and Financial Planners absolutely must know. The material is presented in a concise, easy-to-understand and well-illustrated format to keep reading time to a minimum. Written by a market technician with 50 years of experience, this is the best explanation of the essential basics of technical analysis that every investor needs to know available – and a must read for every Financial Advisor, Financial Planner and stock broker. CHAPTER 1 – WHY TECHNICAL ANALYSIS? CHAPTER 2 – PRICE IS EVERYTHING! CHAPTER 3 – WHY CHARTS? Walter Deemer is a quasi-retired market analyst who worked for Merrill Lynch, Tsai Management and Research and the Putnam Management Company before striking out on his own in 1980. He graduated from Penn State with honors in 1963 and has been aggressively continuing his education in the School of Hard Knocks ever since. He has been married to his wife, Bobbie, for 40 years. They live on a still unspoiled part of the North Fork in Port St. Lucie, Florida, where they have identified 120 species of birds from their yard.